Valeant’s stock has fallen over 85% in the last year, in part because of scrutiny over its pricing practices. The House of Representatives is investigating the company for jacking up the prices of two heart medications over 200% and 500% respectively. Hillary Clinton has called out the company in her campaign videos, and the Senate has gone after the company for this practice as well. This issue, combined with accounting issues, forced the company to say that it would change its business model, and rely on sales volume to generate revenue last December. It also said it would cut some prices — just some. Valeant Pharmaceuticals doubled the price of a drug called Seconal, which helps terminally ill patients end their lives peacefully, according to a report from KQED News. Valeant purchased the drug last February, and jacked up the price from $1,500 to $3,000 after the state of California proposed legalizing assisted suicide. The KQED report states that Seconal is an 80 year old drug. Valeant’s downfall is not exactly McKinsey’s fault but its fingerprints are everywhere. Half of its six-person senior executive team formerly worked at McKinsey, including Michael Pearson, its chief executive, and Robert Rosiello, its finance director. So did Ronald Farmer, the director who chairs its “talent and compensation” committee, which temporarily transformed Mr Pearson into a billionaire…. Like Enron’s “asset-light” strategy of trading power rather than owning power plants, Mr Pearson brought a consultant’s clinical eye to pharma. He despised costly research (“Be prudent about investing ahead of need — curse of the industry” was one motto), preferring to acquire proven drugs and raise prices. No one did this more abruptly than Mr Pearson: “Our strategy is basically the education I had through McKinsey,” he said in 2014. He turned Valeant into a hyperactive acquisition vehicle, which not only benefited Wall Street banks but consulting firms for whom post-merger integration work is a labour-intensive, high-margin operation. McKinsey provided the intellectual underpinning for pharma companies to rethink radically in the mid-2000s, when drugs pipelines seemed to have dried up and research productivity fell. As the firm’s partners concluded repeatedly in calling for “a bolder, more radical approach to Big Pharma’s operating model”, boards and executives had to alter course and cut costs. And Pearson put that into place not only at Valeant, but for years before that as the head of its global pharmaceuticals practice. Even though drug companies have very handsome cash flows, they now prefer to leave the hard work of discovering new drugs to smaller players like biotech companies,**** snapping them up if they make a breakthrough. Roy Poses at The Health Care Renewal blog has written with great energy and detail about the corrosive effect of what he calls generic management, or what could also be described as misrule by MBAs, on the delivery and quality of health care. Not only do they increase the cost of the adminisphere through their lofty pay, but they also make clear that they have little interest in or respect for clinical expertise, and wind up degrading care and demotivating staff. Given how many MBAs have been churned out, and how they’ve wound up ensconcing themselves in other fields, like higher education, which similar dubious effects, one might argue that Valeant-like strategies would have inevitably have taken hold. But McKinsey operated as a major transmitter and legitimator of extractive practices. * Pharmaceutical companies pay so little tax that many top tax professionals believe the companies exaggerate the tax savings they will achieve through inversions in order to assure shareholder approval. ** One could argue that “maximizing shareholder value” has served as an excuse for rent extraction by top executives, so this outcome is a feature rather than a bug. *** Bear in mind that that 13% figure overstates what laypeople would consider to be R&D by a large degree. For the 15 years, well over 80% of FDA “new drug applications” are for extensions or minor reformulations of existing drugs. In other words, the “new drug application” process as currently practiced is mainly about extending license protection, not invention. 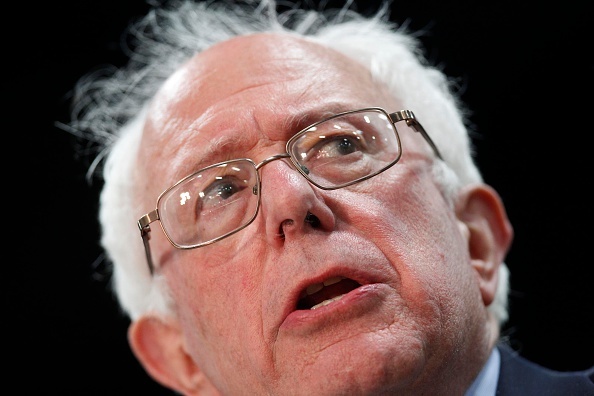 CINCINNATI (The Borowitz Report)—Republican front-runner Donald Trump was crying foul on Monday after Vermont Senator Bernie Sanders allegedly dispatched an army of vegan thugs to attack a rally of peace-loving Nazis in Cincinnati. According to Trump, he had begun to address a group of “orderly and civil Nazis” at a downtown arena when his audience was suddenly set upon by an unruly mob of angry vegans, many menacingly clad in Birkenstocks and sustainable garments. The Sanders supporters, singing an alarmingly militant version of Simon & Garfunkel’s “America,” marched into the arena and began “intimidating and threatening” the Nazis, Trump said. “One of them tried to swing an NPR tote bag at my head,” the terrified Nazi said. 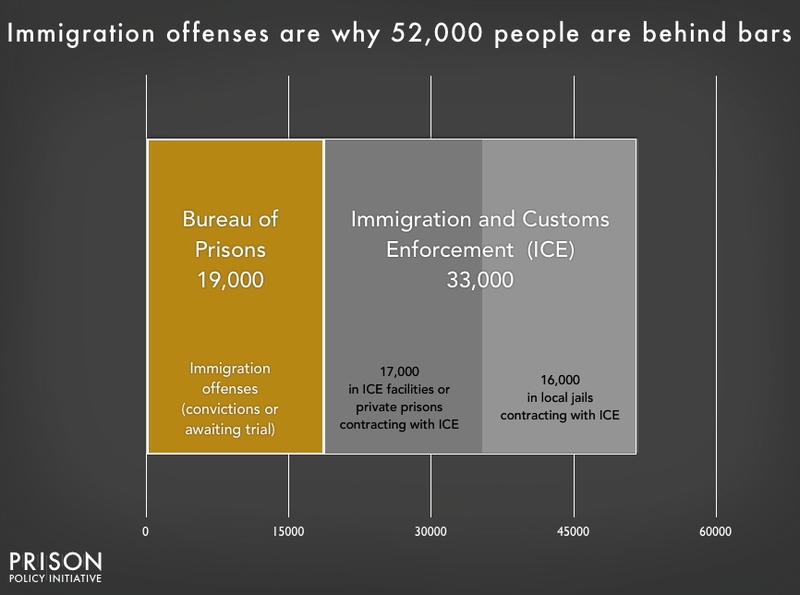 Wait, does the United States have 1.4 million or more than 2 million people in prison? 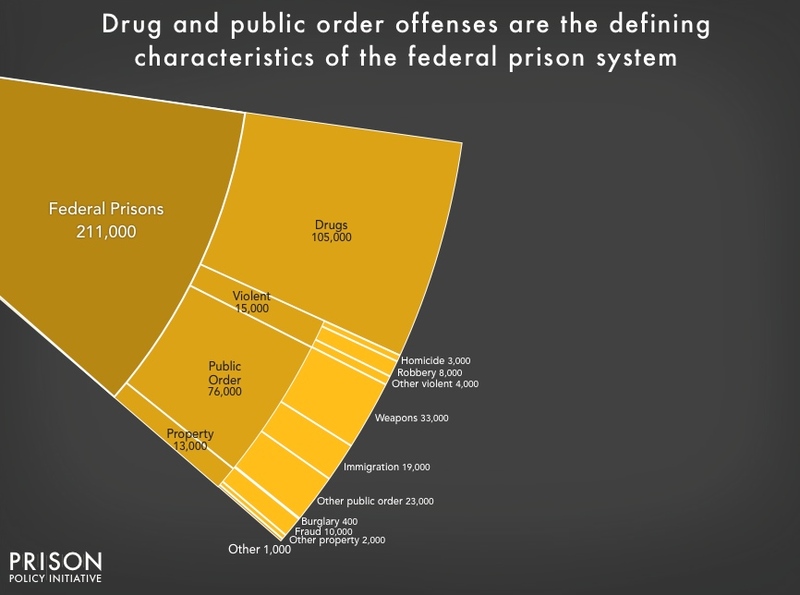 Are most people in state and federal prisons locked up for drug offenses? Frustrating questions like these abound because our systems of confinement are so fragmented and controlled by various entities. 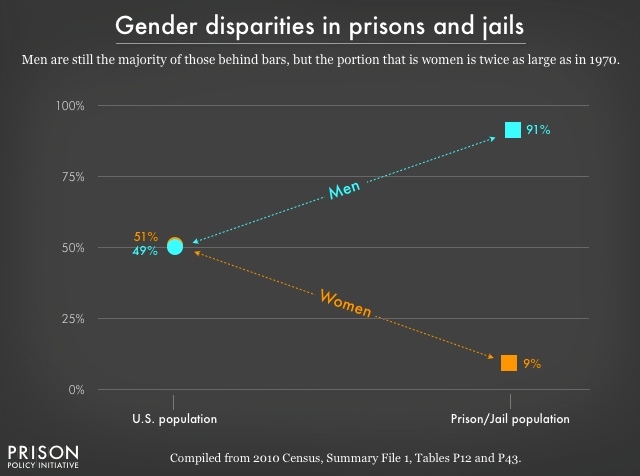 There is a lot of interesting and valuable research out there, but varying definitions make it hard — for both people new to criminal justice and for experienced policy wonks — to get the big picture. This report offers some much needed clarity by piecing together this country’s disparate systems of confinement. 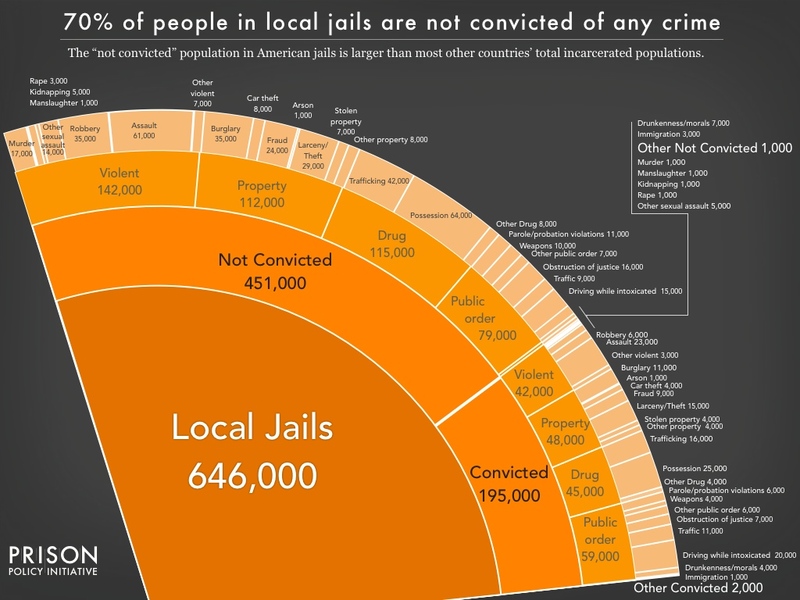 The American criminal justice system holds more than 2.3 million people in 1,719 state prisons, 102 federal prisons, 942 juvenile correctional facilities, 3,283 local jails, and 79 Indian Country jails as well as in military prisons, immigration detention facilities, civil commitment centers, and prisons in the U.S. territories. 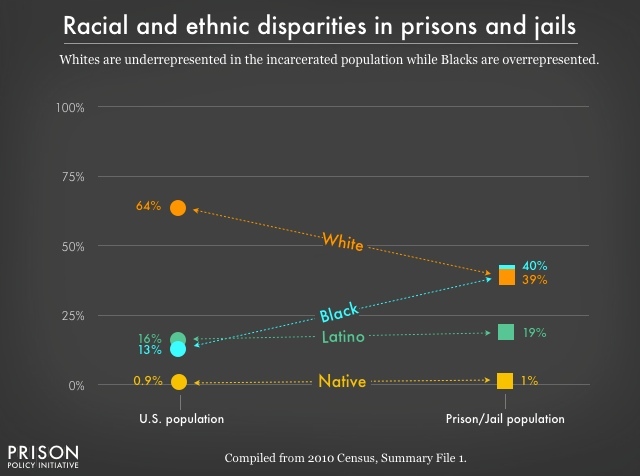 And we go deeper to provide further detail on why convicted and not convicted people are locked up in local jails. 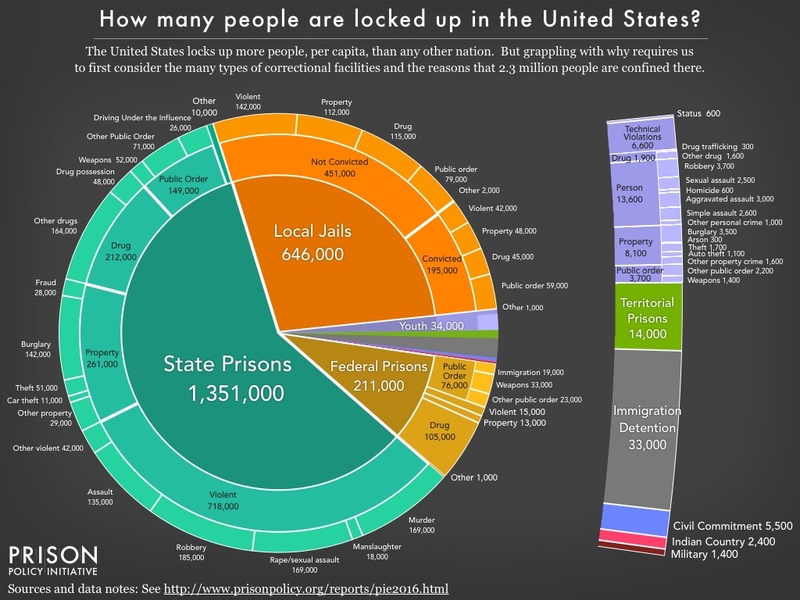 While this pie chart provides a comprehensive snapshot of our correctional system, the graphic does not capture the enormous churn in and out of our correctional facilities and the far larger universe of people whose lives are affected by the criminal justice system. Every year, 636,000 people walk out of prison gates, but people go to jail over 11 million times each year. 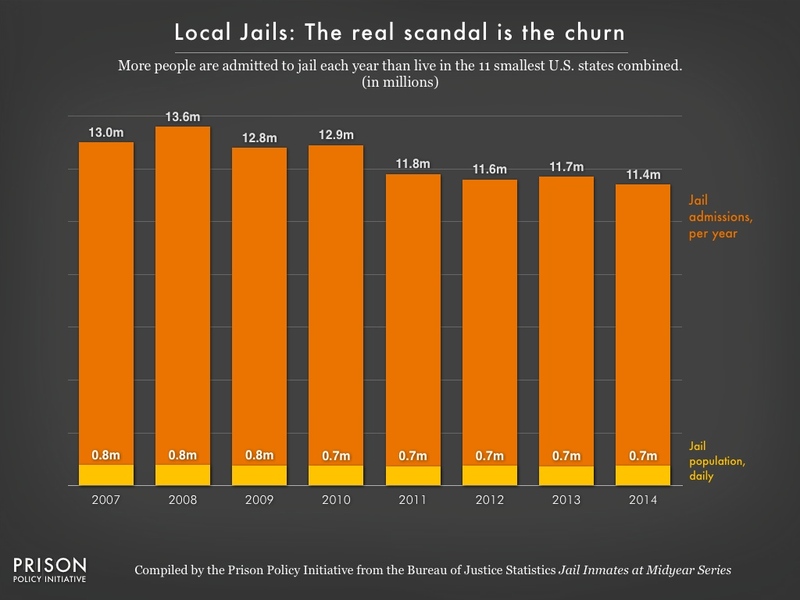 Jail churn is particularly high because most people in jails have not been convicted. Some have just been arrested and will make bail in the next few hours or days, and others are too poor to make bail and must remain behind bars until their trial. Only a small number (195,000) have been convicted, generally serving misdemeanors sentences under a year. With a sense of the big picture, a common follow-up question might be: how many people are locked up for a drug offense? We know that almost half a million people are locked up because of a drug offense. 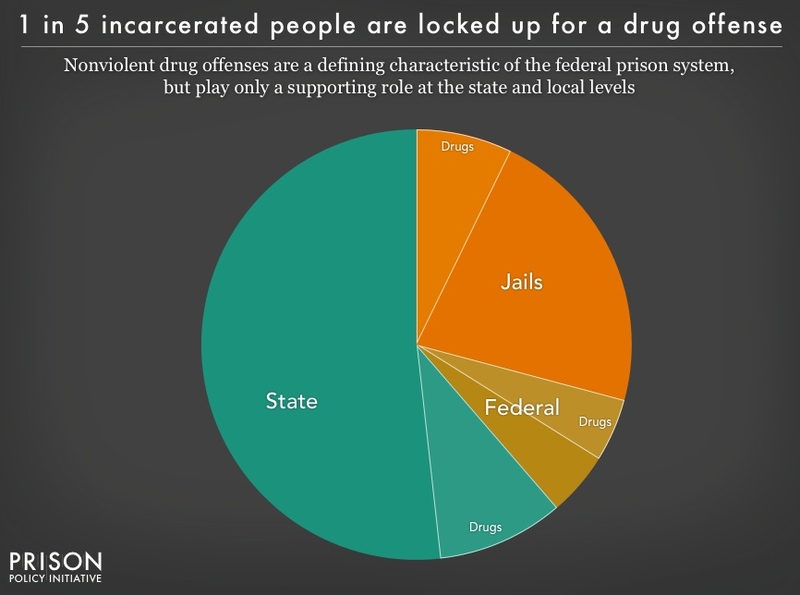 The data confirms that nonviolent drug convictions are a defining characteristic of the federalprison system, but play only a supporting role at the state and local levels. 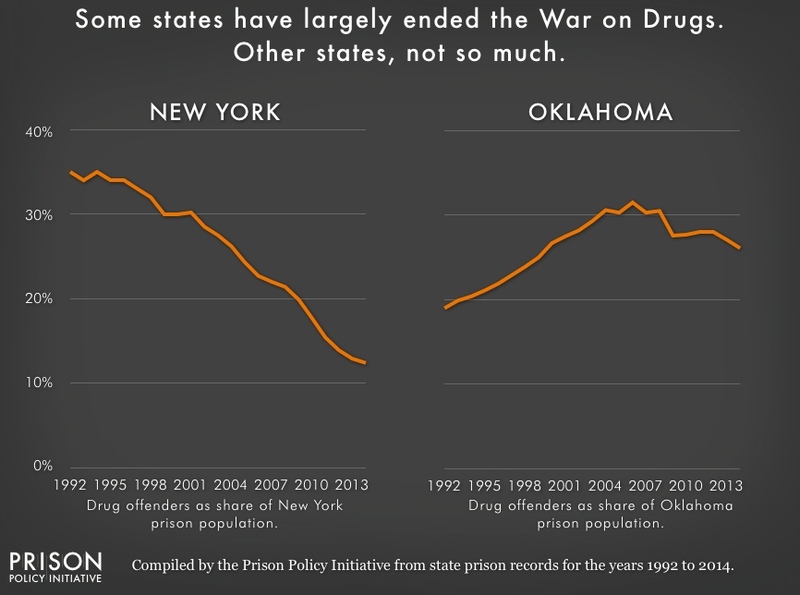 While most people in state and local facilities are not locked up for drug offenses, most states’ continued practice of arresting people for drug possessiondestabilizes individual lives and communities. 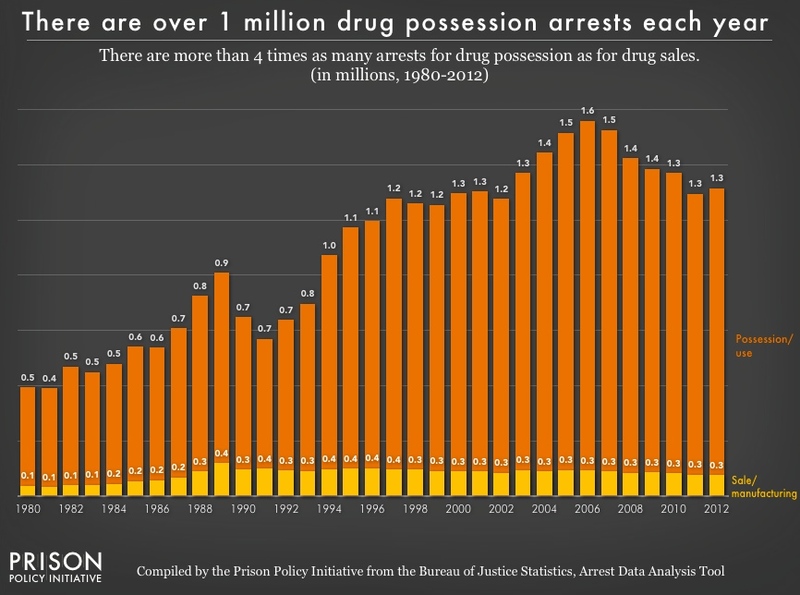 Drug arrests give residents of over-policed communities criminal records, which then reduce employment prospects and increase the likelihood of longer sentences for any future offenses. All of the offense data presented comes with an important set of caveats. A person in prison for multiple offenses is reported only for the most serious offense so, for example, there are people in prison for “violent” offenseswho might have also been convicted of a drug offense. Further, almost all convictions are the result of plea bargains, where people plead guilty to a lesser offense, perhaps of a different category or one that they may not have actually committed. And many of these categories group together people convicted of a wide range of offenses. For example, “murder” is generally considered to be an extremely serious offense, but “murder” groups together the rare group of serial killers, with people who committed acts that are unlikely for reasons of circumstance or advanced age to ever happen again, with offenses that the average American may not consider to be murder at all. For example, the felony murder rule says that if someone dies during the commission of a felony, everyone involved is as guilty of murder as the person who pulled the trigger. Driving a getaway car during a bank robbery where someone was accidentally killed is indeed a serious offense, but few people would really consider that to be murder. Do policymakers and the public have the focus to confront the second largest slice of the pie: the thousands of locally administered jails? And does it even make sense to arrest millions of poor people each year for minor offenses, make them post cash bail, and then lock them up when they can’t afford to pay it? Will our leaders be brave enough to redirect corrections spending to smarter investments like community-based drug treatment and job training? 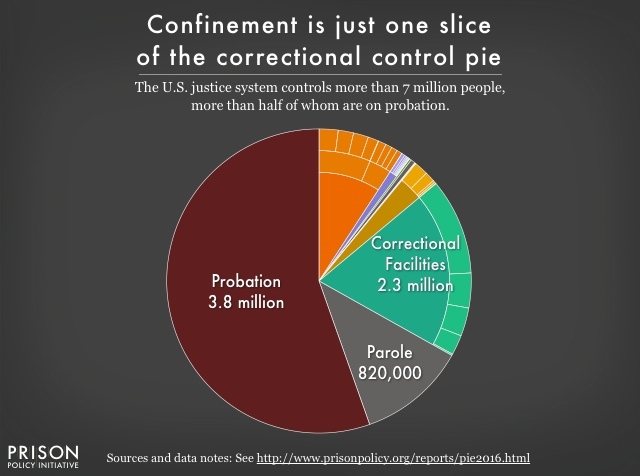 And once we have wrapped our minds around the “whole pie” of mass incarceration, we should zoom out and note that being locked up is just one piece of the larger pie of correctional control. There are another 820,000 people on parole (a type of conditional release from prison) and a staggering 3.8 million people on probation (what is typically an alternative sentence). 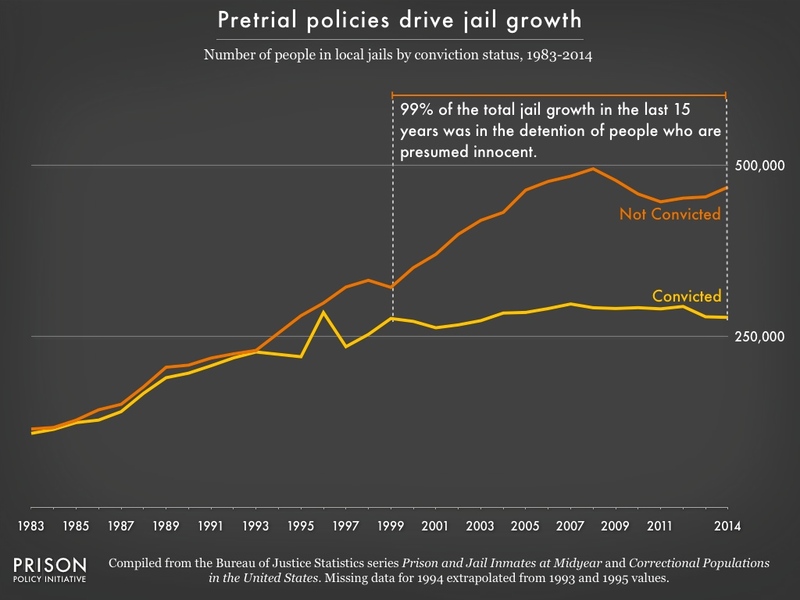 Particularly given the often onerous conditions of probation, policymakers should be cautious of “alternatives to incarceration” that sometimes widen the net of criminalization to people who are not a threat to public safety. This 2016 report was made possible by a generous grant from the Public Welfare Foundation and the contributions of individuals across the country who support justice reform. 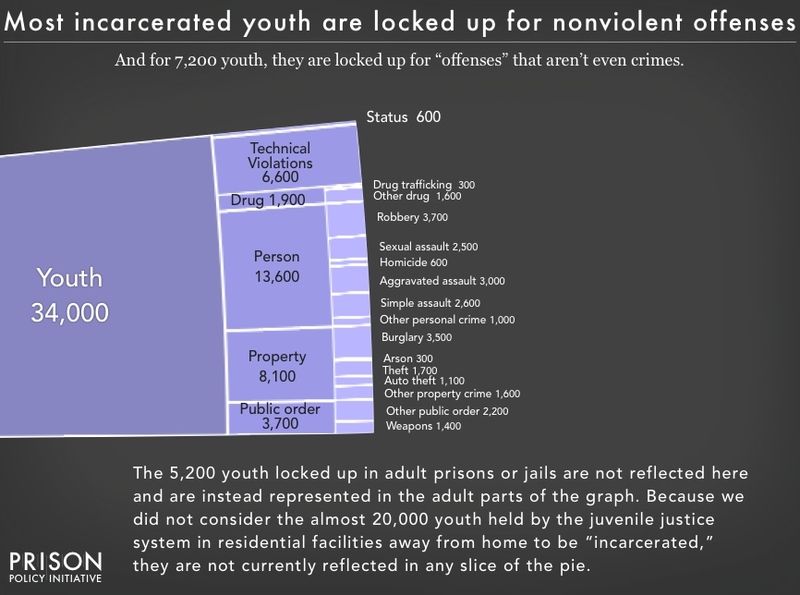 The infographic slideshows and the graph of correctional control were made possible by Gabe Isman of our Young Professionals Network. Bob Machuga and J. Andrew World helped with design issues, and Alison Walsh helped us gather research. Melissa Sickmund at the National Center for Juvenile Justice and Todd Minton at the Bureau of Justice Statistics expanded our knowledge of agencies’ datasets; and Alex Friedmann, Neelum Arya and Drew Kukorowski provided invaluable feedback on earlier drafts of this report. Any errors or omissions, and final responsibility for all of the many value judgements required to produce a data visualization like this, however, are the sole responsibility of the authors.